We had a lot of new equipment that came in lately, and this is no exception. Say hello to the Taylor 337-27! Like your soft-serve machines that you see in your buffets or other restaurants, this machine has the ability to carry two different ice cream flavors, allowing you to swirl as necessary (this symmetry is not only evidenced by the dispensing levers, but the two hopper lids above that’s not shown in the above picture). If you look at a soft-serve manufacturer’s website, you’d think this is the step up. But in our Frog minds, having two flavors is pretty much the gold standard for serving ice cream. 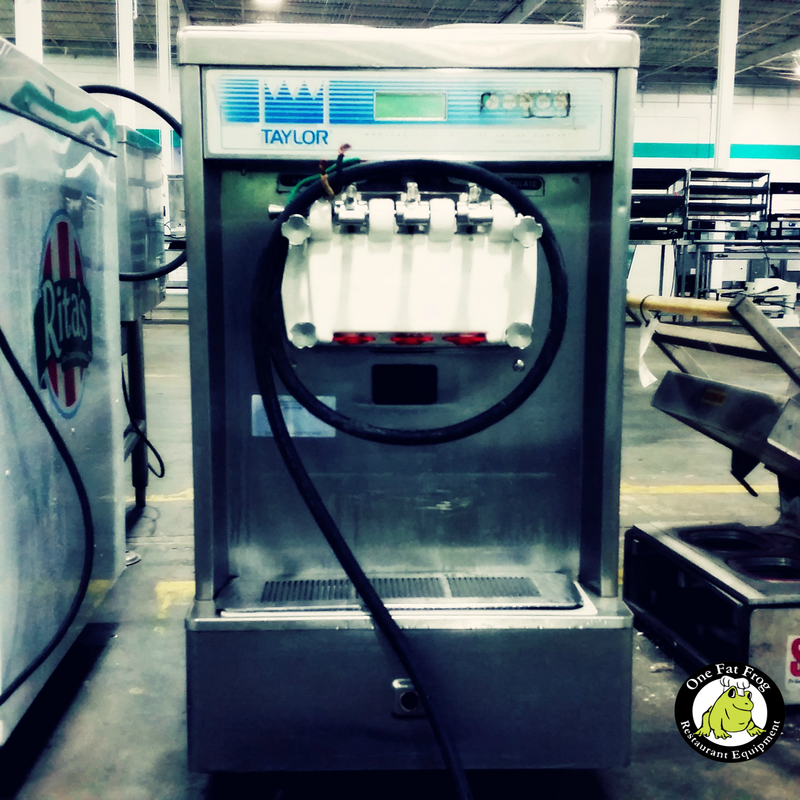 With two 2.8-quart freezing cylinders and two 14-quart hoppers, this can go through easily a lot of gallons before you have to worry about refill (although depending on the size of your restaurant, going through gallons of ice cream might be normal for you). And the big thing about this soft-serve? Digital controls with a LED readout. For a machine that’s probably suited to solid state controls (knobs, buttons, and switches)–this is pretty advanced stuff. The computer in the Taylor will let you know when to start adding more ice cream mix, and will go to Standby Mode (kind of like Sleep mode) automatically when it’s out. And maybe the other thing about standby mode? It will automatically go to standby mode to maintain temperature on the hopper and the cylinder. After all, the mixing, the churning, and the freezing is all done in one machine (something that would probably take hours for us humans and frogs). You may think this is the Lexus of soft serve machines, but consider this more like the Honda Accord of soft serve machines–dependable, and popular.